Everyone likes a good bargain, but when it comes to hay, low price often equates to poorer quality. Because hay is often sold by the bale, the amount of savings from the “good bargain” can be reduced substantially if there is a negative impact on herd nutrition. So what constitutes “poor quality hay?” It is hay that limits how much a cow will eat, has a low energy value, low protein content, and as a result requires a large amount of supplemental feed to support cow performance. Poor quality hay generally results from inadequately fertilized fields and/or harvesting more mature plants to increase yield per acre. This combination of sub-optimal forage management leads to increased plant fiber content, lower digestibility and ultimately lower nutritional value. Intake is reduced as fiber content increases. Mature or “rank” hay reduces the total amount cows willingly consume each day. It hurts both their appetite and the amount their rumen can physically hold. Likewise, the increased fiber content decreases the digestibility of the hay, which also contributes to the gut fill limitation imposed by poor quality hay. Cow intake requirements change throughout the production cycle, but increased intake requirements do not equate to greater intake when the quality is poor. Just because she needs more nutrients does not mean she will eat more. Energy limitations result from increased fiber content which decreases the digestibility of the hay. The more mature the hay the less energy that is available from each mouthful. Coupling limited energy availability and reduced intake negatively impacts cow performance. Compounding the nutritional issue is that prior to calving and during lactation cow energy requirements increase and reach their peak. Therefore, poor quality hay reduces cow performance expressed as milk production and reproduction. Higher fiber content also limits the digestibility and availability of the protein in the hay. Hay quality compromised by low fertility, causes protein content of the forage to be reduced. Low protein diets from poor quality hay also limits intake of forage because of the deficient nitrogen and protein supply for the rumen microbes, which are actually digesting the forage. Limitations on the protein concentration ultimately limits cow productivity. So let’s consider all the characteristics that are limiting in poor quality hay. The hay that limits cow hay intake and nutrient intake lead to the cow mobilizing body tissue to meet nutrient deficiencies. There is a limited amount of body fat and muscle that a cow can mobilize to support her production. Mobilization of body fat and muscle over time leads to decreased cow body condition score (BCS). Decreased cow body condition score below the pivotal BCS of 5 leads to decreased cow productivity and decreased cow reproductive performance. The figures below demonstrate the effect of different hay qualities on estimated cow dry matter intake potential, TDN/energy intake, and crude protein intake relative to what a 1200 lb, average milk potential cow requires during the critical months leading up to calving and after calving. As you can see, hays frequently produced and purchased in the Southeast are quite limiting for cow intake, energy supply, and protein supply. Bale 1 does an adequate job of maintaining a cow, bale 2 a fair job, but bale 3 and 4 leave much to be desired. The limited intake and energy supply in the hays result in body condition score loss from 5 to 4 by the cows in as few as 25 days for Bale 4 one month before calving, to as long as 217 days after calving for Bale 1 . The conclusion here is that bad hay results in rapid cow body condition score loss at critical times in the production cycle. The direct cost of bargain hay is only known if you have results of a forage test, know the true quality of the hay is, and decide to fix the problem by purchasing supplements to fill the nutrient deficiencies. Supplemental feeds can improve intake limitations and fill any energy and protein deficiencies. The cost to fix the hay is determined by how large the intake, energy, and protein deficiencies are that need to be fixed, and the cost of the supplements considered. 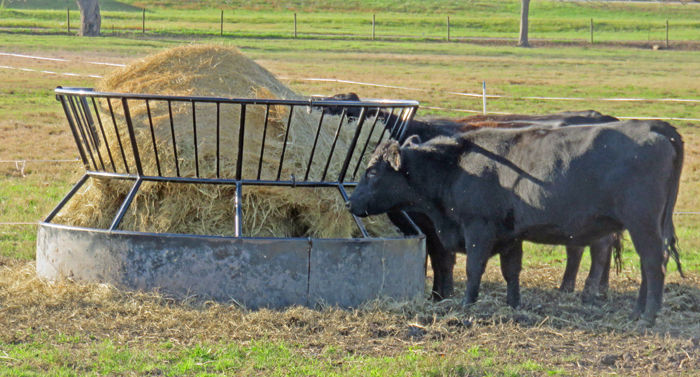 The indirect cost of bargain hay results in decreased cow performance that is manifest as decreased pregnancy rate and weaning weights of calves. Limitations on hay intake and the deficiencies in energy and protein from the hay lead to increased costs associated with hay feeding. Coupling the cost of the hay, hay waste as result of poor quality hay, and additional supplementation cost all adds up, and eat into enterprise profitability. Bargain hay ultimately costs you twice, first when you purchase the hay and next when you feed it.